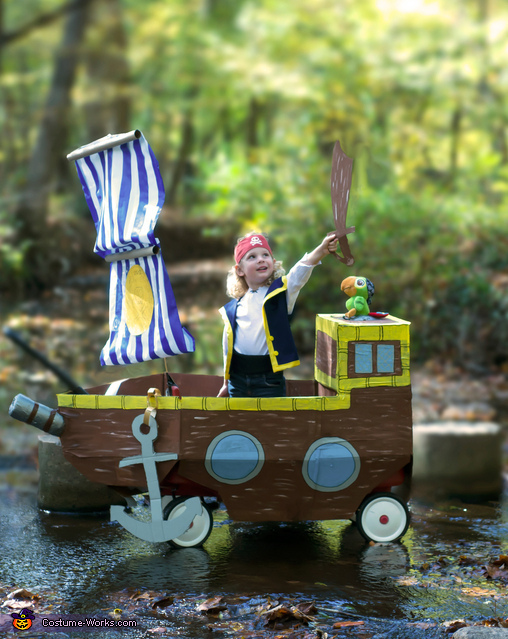 My son is a big Jake and the Neverland Pirates fan. I sewed him a Jake vest and shirt for his birthday, and we decided to add to it to make a Halloween costume. I turned his wagon into a boat by taping together boxes and painting them. I made the sail out of a shower curtain, meter sticks and blue duct tape. I drew the crest on yellow paper and taped it to the sail. I also made a sword out of cardboard and painted it. My daughter dressed up in a pirate costume as Captain Hook. We turned her scooter into the tick tock croc. I painted cardboard for the mouth and tail and attached it to the scooter. I painted a frisbee as the clock in the middle of his mouth. I wore a pink sweater with jeans and made a pink bandanna to portray Izzie with my kids.